On a way to Udiapur with my family we have taken 5 hours break in Jaipur so that we can explore the major attractions of India’s Pink City. Jaipur is called Pink City of India because of several pink stucco buildings that lie in the periphery of this city. 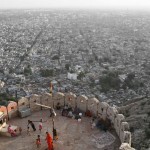 This Capital City of Rajasthan is well connected with India’s major cities via rail, road and airways. I along with niece and cousins started our Udaipur journey from Delhi in Tempo Traveler. We began our drive in early morning and reached Jaipur by 2 pm. This 6 hour journey was pleasurable because we got ample of time to gossip and many things to share because we all are meeting after the time span of 2 years. Throughout the ride we shared our past memories and pulled each other legs. Before embarking our Jaipur excursion we took traditional Rajasthani food in our lunch at roadside restaurant. The taste was so good that it is still lingering on my taste bud. After satisfying our appetite we went to see the Hawa Mahal which is the icon of this place. This is one of the most famous attractions of this place which is visited by almost every tourist who comes here. Hawa Mahal is the man made marvel which is also known as ‘Palace of Winds’ or ‘Palace of the Breeze’. This is a pyramid-shaped five storied facade made up of red and pink sandstone. 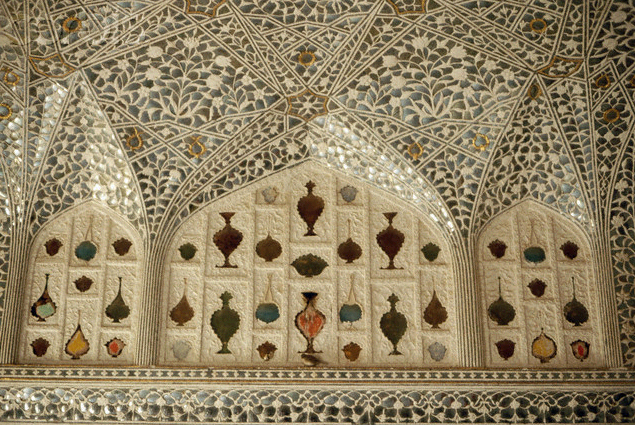 We were amazed by the beauty of 953 small windows popularly known as ‘Jharokhas’ which are decorated with tiny lattice work. One of our cousins who worked in Tourism industry briefed us about the whole structure along with its historical and cultural significance. She told us that it was built for the women of the Royal Families to watch various activities taking place on the streets. It is the wonderful Rajputana structure which was built by Maharaja Sawai Pratap Singh in 1799. After seeing this Rajasthan wonder we headed for Amber fort which is magnificent building and among the finest example of man made imaginations crafted out of stone carving and adorned with beautiful decorations. The magnetic constructions of white marble, red sandstone and delicate decorations make Amber fort a grandiose structure which lures scores of tourists to this place. Apart from this the Maotha Lake in foreground adds extra glamour to this structure which touches the heart of every visitor and we were among them. Again our cousin briefed about this heart gripping palace. The construction of this fort was commenced in 1592 during the reign of Raja Man Singh I but it was finally completed during the period of Raja Jai Singh I. Intricate carvings, minute mirror work and mosaic work throughout the complex utters the glory of Rajputana royalty and legacy who made this grand structure. The major attraction of this fort is Diwan-e-Aam or the ‘Hall of Public Audience’ which is the forty pillared marquee built for Maharaja to meet the general public. Though there are many attractions inside the fort but Jai Mandir ‘Hall of Victory’ famous for stunning ceiling adorned with mirror work and an inlaid panel captivated our attentions for long time. 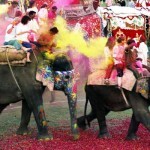 The elephant ride is the best way to explore the diverse beauty of this fort. But due to lack of time we couldn’t enjoy the royal ride of gentle giant. The visit to these two royal structures pleased our eyes and rejuvenated our mind but exhausted our stamina. So we dropped our plan to visit any more attractions of this historical city. On insist from cousins we went to Jauhari Bazaar which is among the best places of Jaipur to purchase tie-and-dye items. 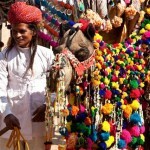 Here, we purchased some semi-precious stones, handcrafted footwear, costumes and handicrafts as a souvenir of this place. After that we again embarked our journey to Udaipur in the same tempo traveler. On the way we stopped for dinner at roadside restaurant where we tasted some of the best Rajasthani food which again filled our appetite but not satisfied our taste.